Pedestrians who are crossing busy streets are often busy doing something else: listening to music, texting or talking on a phone. Those distracted walkers often fail to look both ways for traffic or follow other safety rules. A study conducted during the summer in Seattle, Wash., may be the largest one yet to look at real-world pedestrians in this age of distraction. It found that more than 26 percent of the 1,000-plus walkers were using electronic devices as they navigated intersections where pedestrians had been hit in the past. Texters were nearly four times less likely than other pedestrians to follow safety rules, including looking both ways, staying in the crosswalk and obeying signals; and both texters and talkers took extra time to cross the street. Music-listeners walked faster but often failed to look for cars, according to researchers from the University of Washington and Seattle Children’s Hospital. The findings could help explain why pedestrian deaths are increasing nationwide even as other traffic-related deaths hit historic lows. Walkers who text, just like drivers who text, may be most at risk, according to one of the researchers, Beth Ebel. “Texting is pulling you out of where you are and putting your mind somewhere else. You’re on autopilot and that puts you on risk,” Ebel said. During the study observed pedestrian behavior was generally in line with that collected by other researchers, including some who test pedestrian behavior in lab simulations. “We are finding very clearly that it’s dangerous to be distracted when you cross the street,” said David Schwebel, a professor of psychology, who runs a pedestrian behavior lab at the University of Alabama in Birmingham. In some of Schwebel’s experiments, people listening to music were more likely to be hit by virtual cars than those who were texting. He speculated that hearing cars may be at least as important as seeing them. But Schwebel added that scientists also looked at talking on the phone, browsing the Internet, listening to music and talking to someone next to you: all increased the risk for pedestrian injury. Unpublished data from emergency room records shows injuries among pedestrians using cellphones increased steadily from 2005 to 2010, said Jack Nasar, a researcher at Ohio State University. Some communities have considered fining distracted walkers. Schwebel said it may take that to change behavior. Nasar favors taking steps such as posting “Put down your cellphone” signs at crosswalks and educating the public. “Parents should tell their children to put down their cellphones while walking,” he said. Today’s technology provides additional solutions to the problem. New pedestrian crossing instruments include rectangular rapid flashing beacons, which have resulted in over 80 percent compliance. In some areas that level of compliance reached 98 percent, according to a study conducted by Electrotechnics Corp. of Marshall, Texas. “New rrfb technology is an affordable solution for rapidly increasing pedestrian safety and stimulating motorist compliance,” said company President Bill Marshall. Certainly, rrfbs are attention getters. The use of an optional indicator for pedestrians allows the pedestrian to see that the beacons are operating. Typical cost of material for a solar-powered rrfb system consisting of two poles and signs is under $10,000. Color pavement marking is another effective bicycle and pedestrian safety initiative. It can also be used for bus lanes, stops and other specifically designated areas. 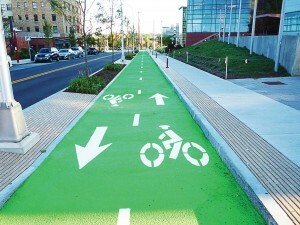 “Color pavement marking increases safety by minimizing conflict between different road users. By making these special use lanes or areas — such as bicycle paths, crosswalks, pedestrian plazas and bus lanes — clearly marked with durable, highly visible color, the lanes are safer,” said Karen Dinitz, marketing and communications director for Transpo Industries Inc. Materials for high friction surfacing and bridge overlays both increase preservation and sustainability as well as safety. Paint and other materials fade or delaminate, requiring regular maintenance. Long-lasting color makes maintaining safety features easier. 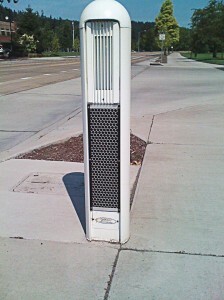 Transpo also offers light pole and sign post breakaway supports that are the standard for roadside safety.